Peanut butter is the secret ingredient that gives this dish incredible flavor that can't be beat. This recipe, created by Camilla Saulsbury, was the 2011 Pork Crock-Star winner for Chili Soup and Stew Dish. 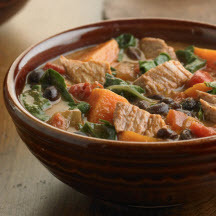 Place pork, sweet potatoes, onions, tomatoes, black beans, chili powder, and cumin in electric slow cooker. Cover with lid, and cook on low-heat setting for 7 1/2 hours. Remove pork from slow cooker, and coarsely chop. Add peanut butter to liquid in slow cooker, stirring to combine well. Stir in pork and season with salt and pepper to taste. Add the Swiss chard to slow cooker. Cook 5 to 6 minutes longer until chard is tender but still bright green.